Audio functionalities in Blender were implemented in 2011 as part of the monitored development program that happens every year in Google Summer of Code. From that moment on, it was possible to do the main audio manipulations you’d expect to be made inside a video editor, such as inserting keyframes for fading in and out, use a crossfade effect, transforming stereo audio in mono and pan it. For more complex projects, however, that ask for a careful sound treatment, you are required to use especialized software. We talked a little about that when we described Blender’s limitations. 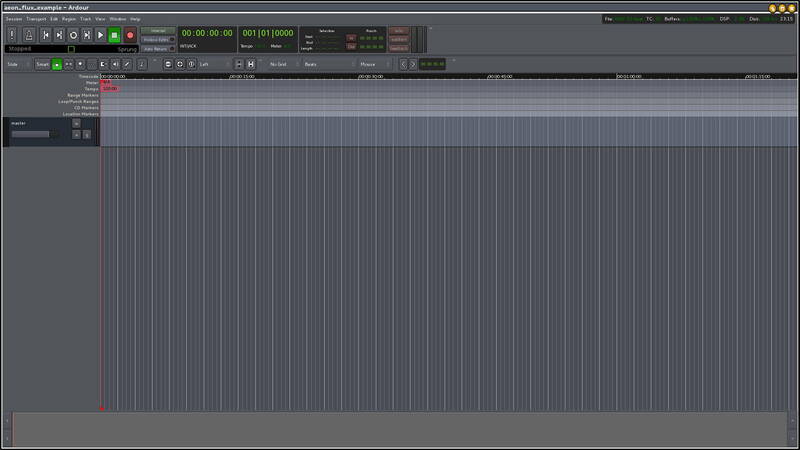 Nowadays, the main free and open source (FOSS) program for DAWs, or Digital Audio Workstations, is Ardour, a complete suite with its own set of effects, plugins and development cycle. During the Red Forest project, in 2013, we felt the need to integrate these two applications. That’s why we decided to act on the solution for the problem in the medium term, developing an especific addon to solve it. 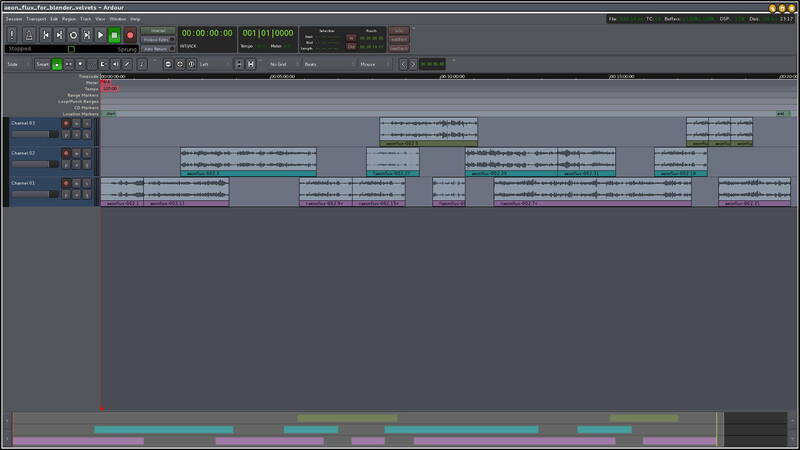 Blue Velvet integrates Blender with Ardour, making it possible to export the your project’s timeline with all it’s audio cuts from the first program in a legible format by the latter. The objective is to allow the video editor to work on a more fluid way with the audio technician. An example of complex project, Red Forest’s Making Of is 32 minutes long. Here, the project’s audios have been arranged to keep the similar interviews on the same channels. The same project, exported from Blender via Blue Velvet, opened by Ardour. To install Blue Velvet, click on the link below to go to the Download Area of the website. 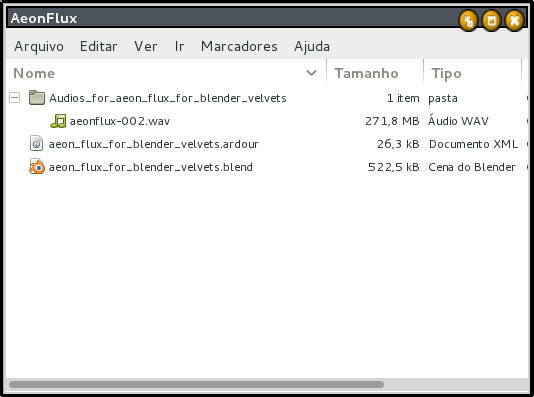 Once downloaded, the file with Blue Velvet (blue_velvet.py) is inside a zipped folder, together with the other Blender Velvets addons. Open it as you would with any regular .zip file and extract them to some place of your choice (for example, at the Desktop). Follow the detailed instructions on how to install Blue Velvet at the How to install the addons section from the page How to configure Blender for video. Pay attention to the instructions related to FFMPEG and to audio configuration. It’s quite easy to use Blue Velvet. The important thing is to export your timeline only when you get to your final version, so that both video editor and audio technician work using the same version. Image 1: With the cuts made, the project is ready to be exported. Notice, on the image, that some videos and audios have been deliberately muted or locked on the timeline. All video, effect or image strips will be ignored by Blue Velvet. Image 2: Make it good practice to organize similar audio tracks on the same channel (or track) in your Blender timeline before exporting. Documentaries, for example, have many excerpts of the same interview and recorded sounds with similar ambient noise that are used in different moments of the narrative. These audios will all go through the same processes inside Ardour, and it’s there that this organization will make most sense. Image 3: Before continuing, save your project. Blue Velvet will not alter it in any way, but will use the path to where the project is stored as reference when executed. Image 4: The image shows in the detail the name and the path of the saved project. Image 5: This is a good moment to review the audio settings of your project. Blue Velvet will use them as reference and you will need them to create a project in Ardour. 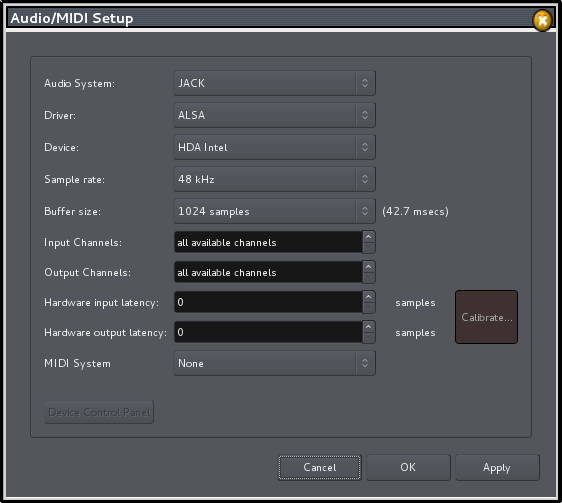 In the image example (use Ctrl + Alt + U to get to this screen), we have stereo 16 bits audio at 48 kHz sample rate, a very usual configuration for video projects. 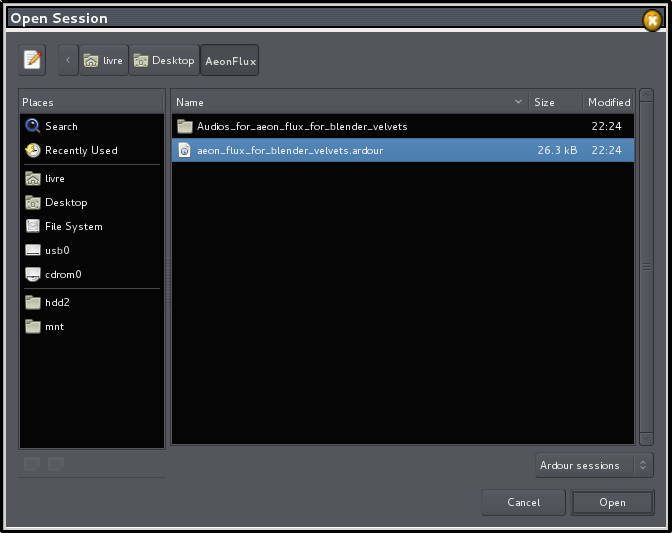 Image 6: On the main menu, go to “File > Export > Ardour (.ardour)”. 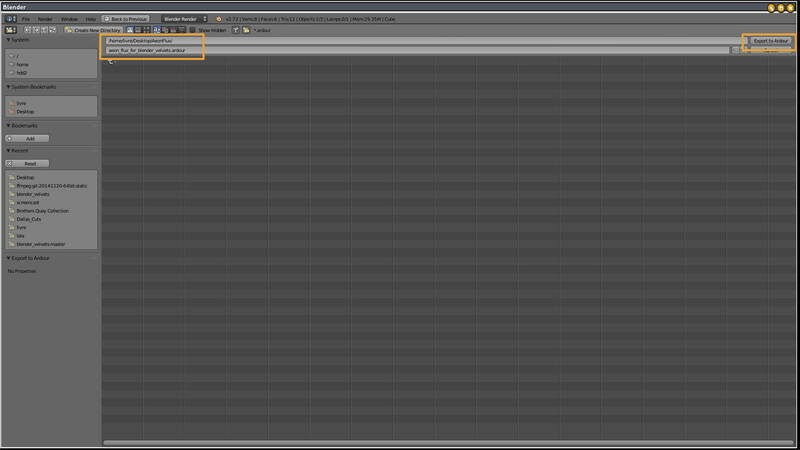 Image 7: It’s recommended to create an especific folder to export the file with the cuts (.ardour) and the audio files. Create it and navigate to it here. Then, name the file to be read by Ardour (the same .ardour) and click on the button “Export to Ardour”, on the upper right of the screen. 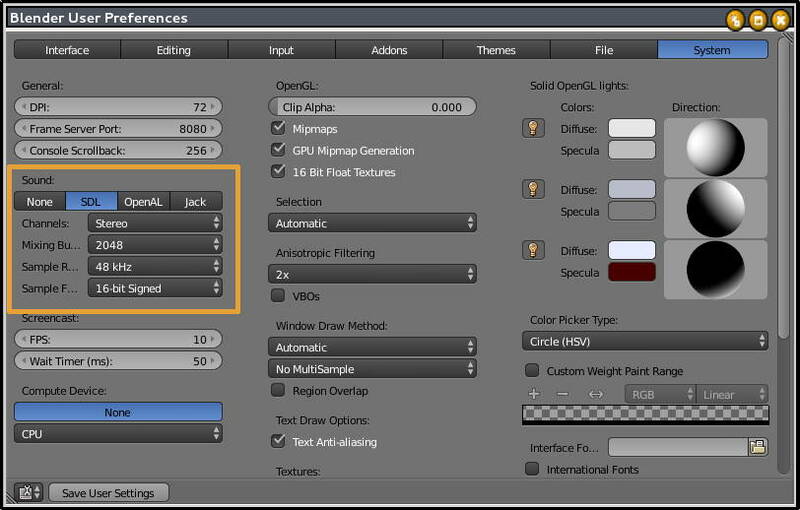 Blender will freeze while it processes the cuts – time will depend on the length of your project and used audios. Image 8: At the end, you will have a .ardour file and another directory inside your folder, filled with audio tracks. In practice, Blue Velvet fetch the audios used on your project from their original videos and copy them here without quality losses and without altering the original videos. In this example, we used only one video as basis for the whole editing project in Blender, but usually this directory will have many .wav files inside it. Image 9: Start Ardour. From here on, if your Blender is not configured to be used with Jack, close it. Otherwise, it will block Ardour from using your system’s audio outputs. Image 10: Name your Ardour session and save it. Since the program creates a lot of other directories when generating a project, use the same folder where your exported project is. 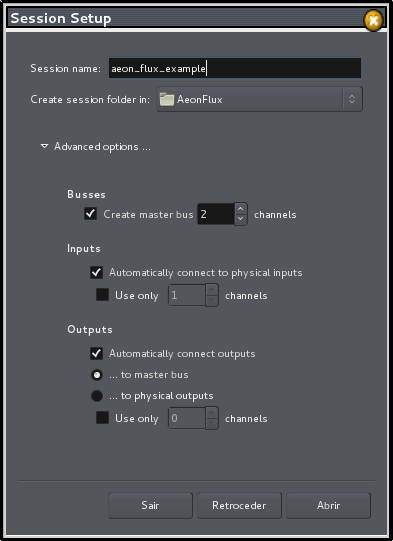 On the advanced options, you can ask the program to connect itself automatically to the system’s audio inputs and outputs. Image 11: On the following screen, use the same setup you had for Blender’s project, with audio at 48 kHz. Image 12: That’s it. Your session is created. Now, you have to open the project you exported from Blender. On Ardour’s main menu, go to “File > Open”. Image 13: Select the file with the extension .ardour. 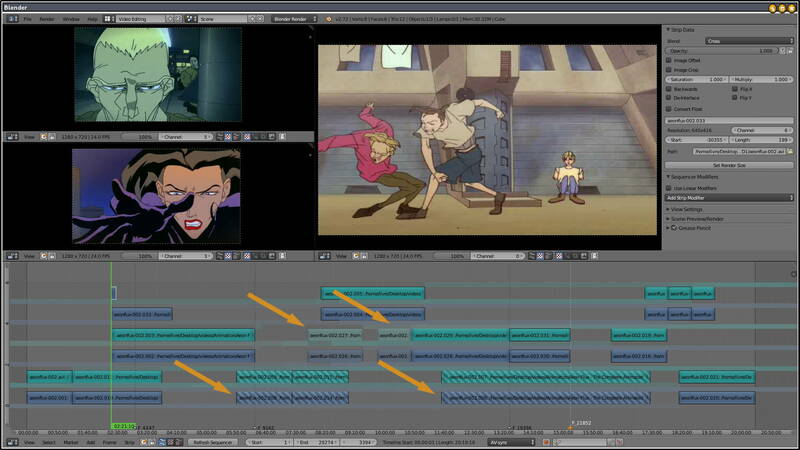 Image 14: On the image, we see the audio cuts are exactly the same as the ones we had on Blender’s timeline of our editing project (check Image 2, above). 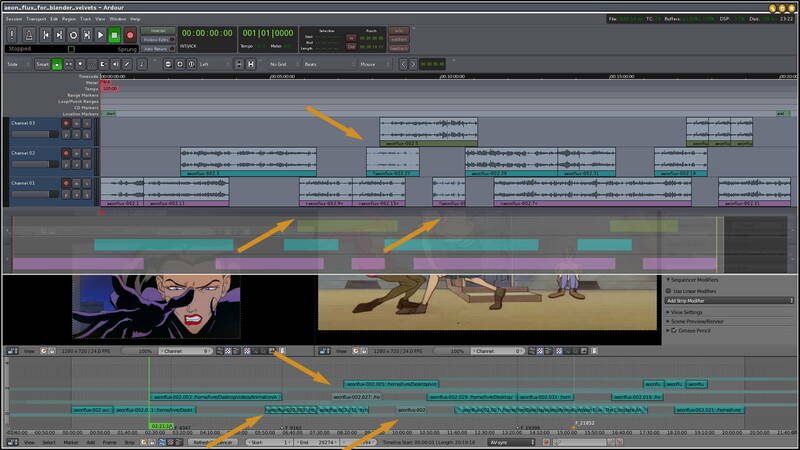 Image 15: On the detail, notice the tracks that were muted in Blender are shown in Ardour with “! !” on the name, while those that were blocked on the timeline are shown with their name between the “>” and “<" signals.